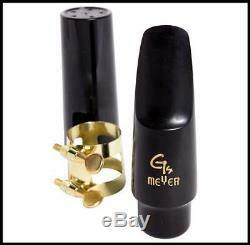 Meyer G Series Alto Saxophone Mouthpiece with Cap and Ligature No 5. With a great vintage sound. The Meyer G Series Alto Saxophone Mouthpiece is designed to reproduce the size and style of mouthpiece chamber and tip opening to achieve the sound of great saxophonists of the past. G Series Alto Saxophone Mouthpiece Specifications: Material: Hard Rubber Model Number 5. D'addario EJ16 Light gauge 12 - 53. Planet Waves Pro String Winder. Ernie Ball Skinny top / heavy Bottom. EB 2215 10 - 52. EB 2221 10 - 46. D'Addario EXL120 10 pack. EB 2223 9 - 42. EB 2220 11 - 48. D'Addario EXL110 Regular Light. Defective, damaged or DOA items will be exchanged for a working unit. A: The customer can choose any transportation method Australia Post, or courier, etc. Q: I need a replacement ASAP! There are no warranties on items such as strings and reeds etc Q: What if my item is defective? Customer is responsible for transportation of the item back to us. We will send out the replacement at our expense. On some selected Products, which are marked within the ad, bank deposit is also available. Q: Can I get a lower price? These products are non-returnable unless there is a known manufacturing fault or defect. The item "Meyer G Series Alto Saxophone Mouthpiece with Cap and Ligature No 5 New" is in sale since Friday, December 13, 2013. This item is in the category "Musical Instruments\Wind & Woodwind\Parts & Accessories\Ligatures & Caps". The seller is "angkor*music" and is located in Portland, Oregon. This item can be shipped worldwide.